Posted on Monday, April 9th, 2018 at 8:14 am. When I was told a few weeks ago that Goodyear was making a comeback into the bicycle tire business, I had to look up what they meant by “comeback”. To be perfectly honest, I didn’t even know that Goodyear wasn’t in the bicycle business. 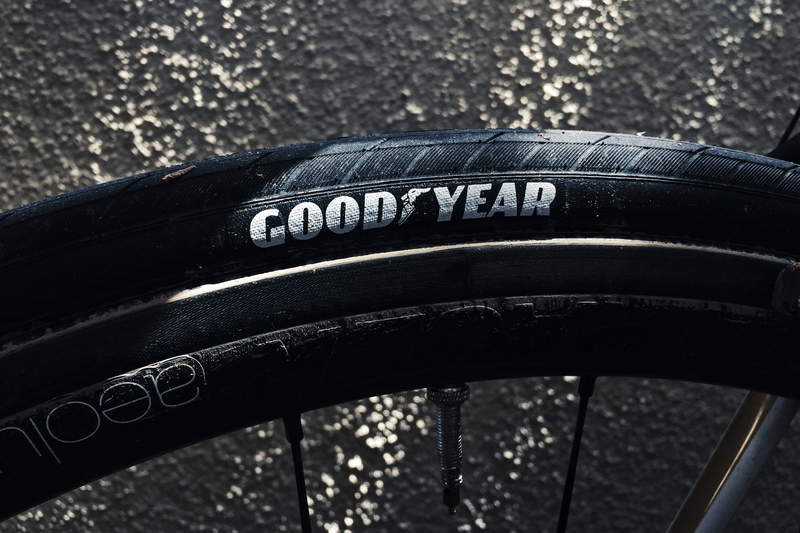 With companies like Continental, Michelin and Maxxis knee deep into bike tires, you’d think Goodyear, the third largest tire manufacturer in the world, would be in the game in some shape or form. Well, they were. As a matter of fact, the Akron, Ohio-based Goodyear produced bicycle tires from the company’s founding in 1898 up until 1976. So unlike Michael Jordan’s one year “retirement” from the NBA, or Johnny Manziel and Dave Chappelle, it’s been 42 years. But guess who’s back, back again? Goodyear is back. Tell a friend. Thank you Eminem for that sweet quote. While Goodyear’s new lineup consists of nine tires, I am just going to focus on the road-going Eagle. That’s right, the sole road tire in Goodyear’s lineup shares the same name as the company’s better known racing rubbers both previously seen in Formula One and currently seen in NASCAR… and most likely as OEM tires in some cars. In fact, Goodyear even used the same font to label “Eagle” on the sidewall. Okay, I get it. The Eagle has a deep, high-performance heritage. And Goodyear was kind enough to send us a pair in 25c to play with before the launch. Our test samples weigh 310 and 311 grams, just a tad over the claimed 300 grams for the 25C tire. Installation was pretty straight forward. I was told the Eagle is mountable with just a floor pump. I managed to get one of the two tires inflated with no sealant while the second tire needed just a tiny bit of sealant and compressed air from my Bontrager TLR Flash Charger. There wasn’t any overnight leakage, either. I did, however, injected some sealant into that one dry tire for extra insurance before my first outing. My first ride using the tires was a 70-mile stroll following the weekend’s atmospheric river that caused some minor flooding, downed trees, and well, unpredictable road conditions that left me yearning for those disc brakes on the Focus Paralane I just sent back and I almost went to IKEA instead of riding. Not your ideal day to try out tires for the first time, or was it? So off I went. Rolling down this 10% hill right outside of my house. The Eagle felt supple, dare I say even better than the Zipp Tangente RT25 I just came off of, or the stable Schwalbe Pro One 25s. Goodyear ostensibly didn’t include much info such as the tpi of the casing used, but did mentioned the inclusion of a Nylon-based fabric from bead to bead called R:Armor to combat against cuts on punctures. Interestingly enough, the Eagle didn’t balloon as much as the other two tires, measuring at 25.55 and 26.17mm on our Bontrager Aeolus 3 TLR D3 rim-braked wheels. It’s definitely a welcoming tidbit if you don’t have a lot of tire clearance. Not long after I navigated out across the slippery Golden Gate Bridge, I ran across this broken Jameson bottle in Sausalito. Last time I rode on wet road with glass, the glass won so I was waiting to hear the tell-tale hiss. Nope. Nothing. The show went on. The more miles I rode on the Eagle, the more I trusted its capability. The proprietary silca-based Dynamic:Silica4 compound designed with a smooth center for low rolling resistance felt lively and comfortable at 90psi. And that “best in class wet grip” Goodyear claims to have is pretty darn good too. The Eagle handled water graciously with its directional sipes on the edges and grooves to channel water from the center. I’d like to see the comparison chart, though. It’s still too early to comment on the long-term durability of the Eagle but it’s looking pretty promising so far. So stay tuned for our long-term report. The Eagle retails for $70 in four widths: 25, 28, 30, and 32. The 30mm and 32mm will also come with a second version that includes reflective strip all the way around the tire.